3.8 out of 5 based on 14 bloggers and 3 commenters. 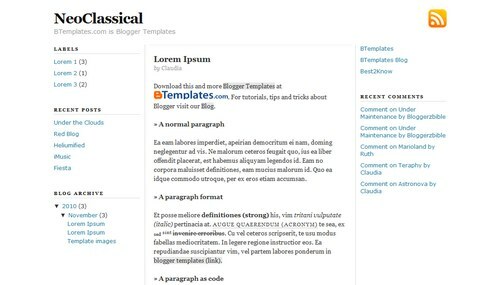 NeoClassical is a free blogger template with 3 columns, left and right sidebars and neutral colors. @Twitty: If you want to use this template, you may change the timestamp format (the hour) to the date today in Settings/Formatting. I really love the simplicity of this layout, but need help moving the right sidebar over. Right now it’s overlapping the body of the site. Please help!